1. Fry or broil cutlets until tender; cool. 2. Cook beans lightly; season and drain. Arrange at bottom of dish with cutlets on top. 3. Soak the gelatin in 1/4 cup of the cold water. Dissolve it in the remaining hot water. Cool. 4. Pour three-fourths of the jelly over the beans and meat. 5. Allow this to set, but keep the remaining aspic in a warm place. 6. When the aspic begins to set arrange halved rings of egg round dish, and whole rings on top of 4 cutlets. 7. Put capers on top of the egg slices. 8. Cut carrots into rings (use a fancy cutter if wished for a fluted edge) and put on the other 4 cutlets. 9. Skin and peel tomato, put slices down center of dish with pieces of red and green sweet pepper. 10. Brush egg slices round edge of aspic to keep them moist; pour remainder over to of garnishes – be careful not to dislodge them. 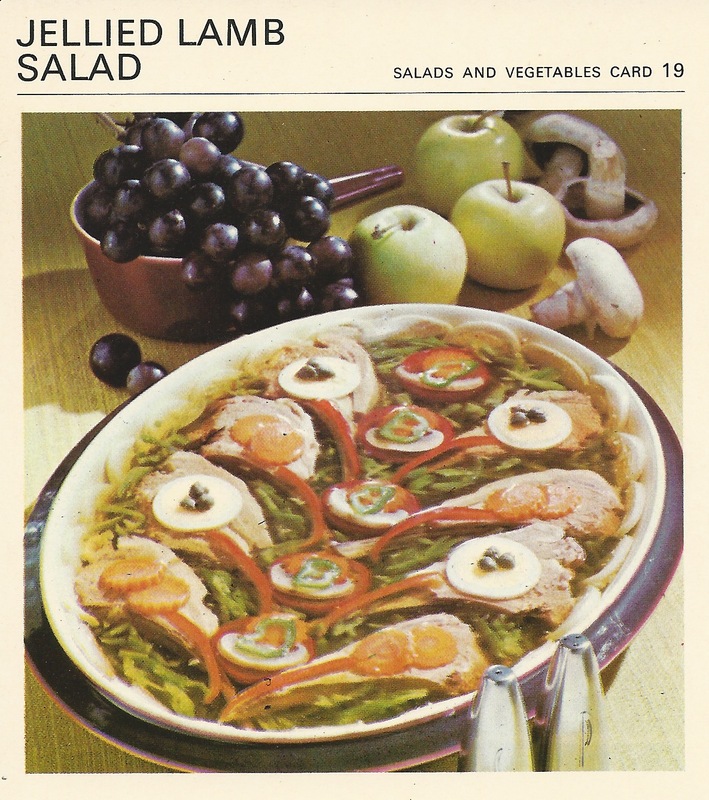 TO SERVE: Cold with lettuce, etc.